High atop a hill with expansive views of forested land and mountains, amidst two and a half acres of green space, is the site of the Coho condominium development; two, four-story buildings designed, and being constructed by, award-winning developer Omicron. 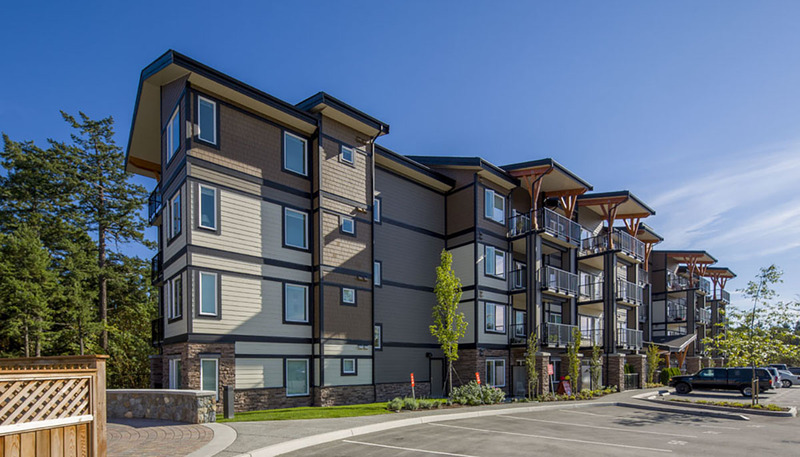 Situated in View Royal, one of BC’s fastest growing municipalities, these stylish, coastal contemporary inspired buildings will offer residents the best of both worlds. Living in a pristine natural setting with woodland trails steps away; Coho is still close to amenities such as shopping, indoor and outdoor recreation and is only minutes from downtown Victoria. With interiors designed by award winning design firm Portico Design Group, every suite will feature airy 9’ ceilings and wide plank hardwood laminate-style flooring throughout the open concept kitchen, dining and main living areas. Spacious patios and balconies with forest or mountain views, add to the relaxing quality of life you can expect at Coho. There is still a selection of move-in ready homes available from Phase 1 available. Phase 2 is already 60% sold and move-in ready October 2015. The Sales Centre is located on top of the hill in the completed building. One and two bedroom suites are available, with seven floor plans and two contemporary colour palettes to choose from – prices starting at just $296,900, include one secured underground parking stall per suite.